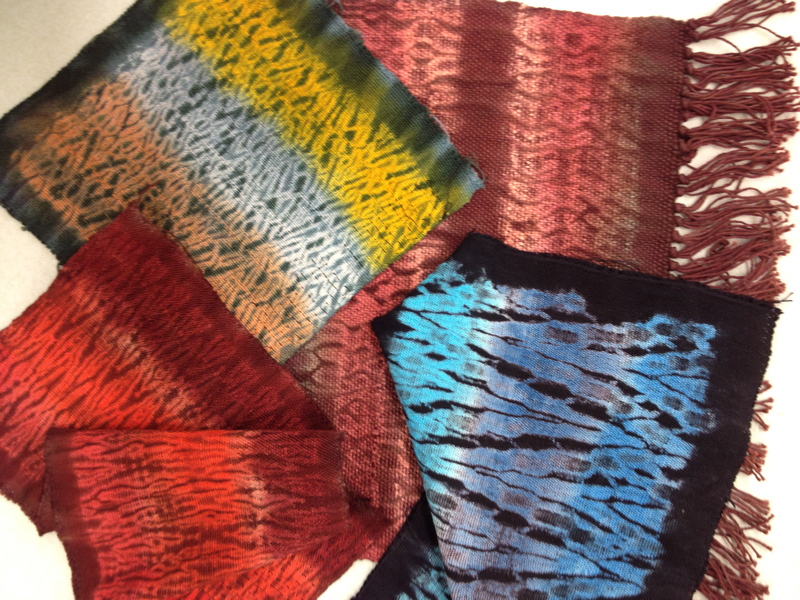 I am offering a woven shibori class at Pullen Art Center. This is the technique I use to make scarves and wall pieces such as “The Storm”. Pullen Art Center has a weaving studio with pre-warped floor looms so we won’t be spending time setting up looms. Rather, the looms are full of white cotton warp just waiting for color. We will spend a lot of time exploring how the dyes interact and creating the patterns as part of the weaving. This should be a fun, relaxed class with lots of possibilities. And you can’t beat the price. Take tie-dye to a new dimension. Woven Shibori is a technique for creating handwoven, uniquely dyed fabrics such as scarves, table linens, or fabric yardage. In this class we will start by making several samples to understand the interaction of dye and the patterns inserted in the cloth while weaving. Experimentation is strongly encouraged so everyone can learn from each other with a wide range of designs. A final project will be planned, woven and dyed, however you may need time outside of class to complete weaving. 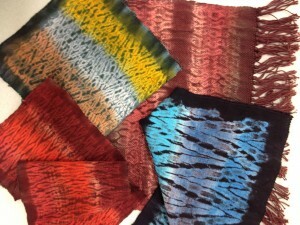 For samples of woven shibori, see my website: http://woventranslations.com/gallery/wearables/ . Weaving experience helpful, but not required. Registration: Stop by Pullen Arts Center or register online using RecLink.